Back in March, Andrew and I were in the middle of the inspection period for the sale of our condo. My parents were gushing about their recently-booked Viking River Cruise for mid-November, and we were completely jealous. On a Tuesday evening, our condo buyers demanded a third radon test--yes, third--for our basement. Needless to say, we were a little fed up. We were sitting at the dining room table feeling a bizarre mix of rage and apathy when we looked at each other and said, "Why don't we call Viking? We can just get information. We don't need to book anything, of course." Half an hour later, we'd booked a Rhine Getaway river cruise for late October. Impulsive? Probably. Worth it? Definitely. Oh, what a blessing it is to have something to look forward to! The pre-trip icing on the cake was Andrew's recent offer and acceptance of a new job, a much-needed change for him professionally. He wrapped up at his previous position two days before we flew away to Europe, and was thus completely detached from work on our trip...also known as the perfect vacation scenario! "Aren't you a little young to be on a Viking river cruise?" "Were you aware that you'd be surrounded by senior citizens?" "So... why exactly did you decide to book this cruise?" "Good for you! Travel as much as you can while you're young. We waited too long, and regret not traveling more before having kids." The rest of this post is an in-depth review of our cruise, covering the itinerary, onboard accommodations, food, service, pros/cons of a river cruise, my recommendations for those considering Viking, and yes, a description of our experience as young people onboard. I hope that my comments prove to be helpful for you as you consider your own future adventures. The Rhine Getaway can be experienced in either direction: from Amsterdam to Basel, or Basel to Amsterdam. At the recommendation of the Viking representative we spoke with at booking, we began in Amsterdam and gradually traveled south into warmer weather. We arrived in Amsterdam around 8:30 AM local time, and were met by Viking representatives just outside of baggage claim. They cheerfully ushered us outside to a comfortable charter bus, which whisked us--and probably 10 other passengers--away to the docking location. Our room was not available upon arrival, because we arrived so early and the previous cruise was wrapping up that day. However, the staff greeted us warmly, offered to store our bags for direct delivery to our rooms, and invited us to rest in the lounge if desired. We were given a helpful, detailed map of Amsterdam, and opted to explore the city on our own for the morning. Viking provided regular shuttles to and from the city center, and distributed paper shuttle schedules from the reception desk. Based on some prior research, we ate lunch at a local establishment, and visited a gorgeous local chocolate shop. Conveniently, the chocolate shop was directly across from a cheese shop which offered complimentary tastings. Nonetheless, we were jet-lagged and I was travel-cranky, so we headed back to the boat around 2:00 PM to check in to our stateroom. Though we were unaware of the option prior to arriving, Viking did offer multiple walking tours of Amsterdam that afternoon. They provided shuttles into the city and local guides for the tour. Again, we were pooped, so we did not attend. However, for those worried about 'missing out' on the Day 1 stop, you may be able to go out on a guided tour depending on your arrival time. A member of the staff escorted us down to our stateroom, located just at the bottom of the stairs near reception. We traveled aboard the Viking Hlin, and booked the cheapest stateroom they had to offer--a standard room, room #100. The friendly staff member pointed out some of the basic features of our room, though he failed to indicate the dial in the bathroom that heats the floor. Don't miss the heated bathroom floor feature, my friends. The dial is located right next to the bathroom outlet, and the result is absolutely glorious. Our stateroom was clean and comfortable, and we immediately unpacked, one of the perks of traveling via river cruise--there was no need to re-pack or move our belongings between destinations. The room included a decent amount of hanging closet space, a safe, shelves in the closet, drawers, and a hidden mini fridge. The TV was loaded with dated but functional Viking applications, including a weather report for upcoming destinations, pre-loaded movies and television shows, itinerary information, and some super-creepy spy cams that allow you to view programming in the Lounge, or to see the view from the bow of the ship. The bed was fairly firm, but that's not uncommon in Europe. We tried to research the size of the bed and found that it was not a standard size, but somewhere between a queen and king. We have a king at home, and were perfectly comfortable during our trip. One item worth noting is that there is no clock in the room--the TV has the time on it if you turn it on, but in the middle of the night, there is no other way to check the time. Bring a watch, and plan to use your phone or other device for morning alarms. Arguably the most important item waiting for us in our stateroom was a copy of the Viking Daily, a printed newsletter that is the bible of daily activities each day. Beginning in the evening on Day 1, the Daily is delivered to each stateroom during dinner, waiting for you upon your return to your room. We took a nap and completely slept through the afternoon programming, which included a wine and cheese tasting in the Aquavit Terrace, a lovely, bright space adjacent to the Lounge on the 3rd level of the ship. Later on, we made our way to the Lounge during the standard 5:30-7:00 PM cocktail hour and were present for the Welcome Briefing at 6:30 PM. During this briefing, we met our Program Director Daniel and were given some basic information about what to expect onboard. In addition, we were informed that there was a mandatory safety video loaded on our TVs that we were required to view within the first 24 hours onboard. If we did not view it, the other TV programming would be "frozen" until the safety video was observed. This was a quick video and not a nuisance at all. From there, the Program Director proceeded to give his Port Talk, a brief 10-15 minute presentation about the following day's activities, recommendations, and tips. I expected these talks to be boring and unhelpful, but they were actually quite informative as we considered what we might like to see and do the following day. I recommend attending the port talks, or creeping on them via your TV Lounge Spycam. For dinner, we opted to dine in the restaurant on the 2nd level of the ship, the more formal of the two dining options. The menu in the Aquavit Terrace is much more limited, and as a result we never opted to have dinner in that setting. We did, however, enjoy lunch on the Aquavit Terrace once or twice for a change of pace. Dinner was less formal than I anticipated, and I breathed a sigh of relief over that--I'd refused to pack multiple fancy outfits in the interest of space, and crossed my fingers that I would not be out of place as a result. There were mixed attire choices, but most people were in jeans or trousers and a nice sweater or blouse. Very few men opted for ties or jackets, on any occasion. "Dressed up jeans" is a perfectly acceptable attire choice at dinner time, if that is your jam. The meal itself was lovely. We're pretty critical about food, and selected Viking largely because of their reputation for quality food and service. Fortunately, we were not disappointed, though I would argue that the effort and attention to meal preparation varied throughout the trip. The first and last meals were the best by far. At both dinner and lunch in the restaurant, we were presented with a printed menu outlining multiple options for a first course, entree, and dessert. In addition, there were always a few boring standards available for the less adventurous eater, like a caesar salad and chicken breast. Be adventurous, my friends! Options generally included a more interesting salad, soup, fish, and plenty of red meat. Vegetarian options were less common, though I'm 100% confident the ship's kitchen staff would be able and thrilled to accommodate dietary restrictions. For our first meal, we enjoyed a cheese souffle with sour cream sauce. I opted for a cod with poppy seed cream sauce, pureed peas, cauliflower, and baby corn for my entree. Andrew enjoyed the vegetable quiche with saffron sauce. And for dessert, we shared a "chocoholic" plate as well as a cheese selection. Each evening's menu included cheese as a dessert option, presenting two new cheeses each day. We found everything to be well-prepared, and the service was absolutely marvelous. More on the staff and service later on. After dinner, the schedule indicated a 9:00 PM program in the Lounge: "Suited: A Nostalgic Music Trio." We were not interested, but heard good things about this Amsterdam-based cover band performing musical selections from the 50s, 60s, 70s, and 80s. Ah, breakfast in Europe. There are few things as enjoyable, in my opinion, as an exquisitely varied, massive European breakfast spread. On the Viking Hlin, we were given the option to have a continental breakfast in the Aquavit Terrace from 6:00-11:00 AM, or have a full breakfast in the restaurant available from 7:00-9:30 AM. We always opted for the restaurant, which had a better spread, and was still primarily served buffet-style. In addition to the generous breakfast buffet, the daily breakfast menu gave diners the option of ordering french toast, eggs benedict, and other basic dishes. We never opted for these, as we found the buffet to be more than sufficient. Behind the buffet bar, a member of the kitchen staff manned the omelet station, and also was available to cook eggs according to preference. After breakfast, we left for the included excursion to the Kiderdijk Windmills. The optional excursion--Dutch Cheese Making--occurred early in the morning, leaving those individuals time to explore the windmills also upon their return. While interesting and lovely to behold, the windmills were a bit of a 'dud' for us. Unless you're really interested in flood-management systems and the history surrounding them, this might not be your favorite day. That said, our tour guide was solid, and we definitely learned a few things about windmills, including the fact that they are often used as residences for the person caring for the windmill. We returned to the ship for lunch, again enjoyed in the restaurant, and the ship cast off around lunch time. We spent the afternoon sailing, and as a result, the Daily included multiple afternoon activities onboard to keep everyone entertained. 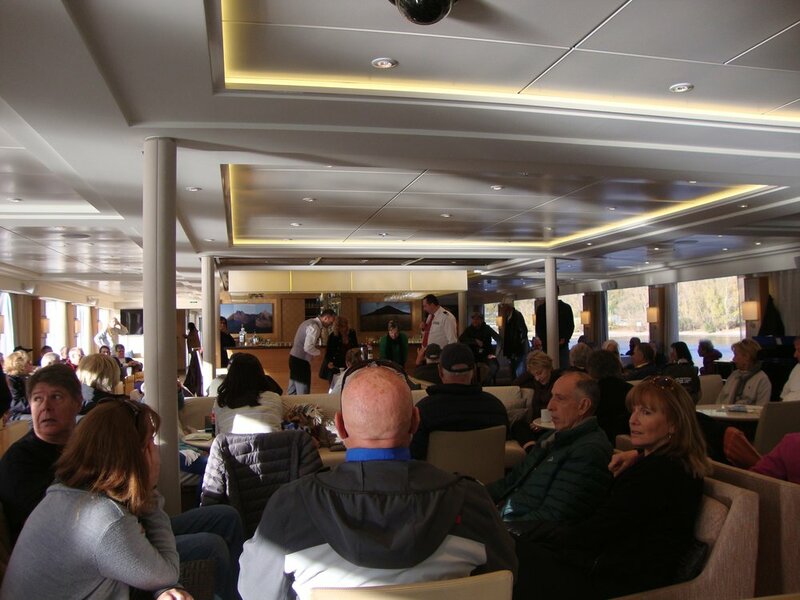 We skipped the wheelhouse tours on the sun deck--an opportunity to interact with the captain and learn about the ship's navigation features. Later, we attended a Dutch teatime from 4:00-5:00 PM in the Lounge, which was mostly an excuse to eat pastries, desserts, and tiny sandwiches. We did not object. At 6:15 PM, the captain and staff officially welcomed us on board and handed out various bubbly beverages for a toast. Both the captain and hotel manager individually went around the room to clink glasses with all attendees, something like 175 people. They also entered to the Star Wars theme, which we respected. We enjoyed the official Welcome Dinner in the restaurant, savoring our two fish options: salmon with corn sauce and caviar, and seared halibut with mashed potatoes and melted leeks. Dessert was chocolate and peanut butter crunch with yoghurt ice cream, an interesting and surprisingly tasty combination. Curious, we briefly visited the Lounge for the 9:00 PM programming, featuring the regular onboard musician, a pianist and vocalist named Gigi. During lunch in the Lounge, cocktail hour, dinner in the Lounge, and post-dinner in the Lounge, Gigi entertained guests with covers of well-known hits, backed by some sort of digital tracks that were synced with his keyboard. While endearing, we were not terribly impressed by this entertainment, but others absolutely seemed to enjoy Gigi's performances. Many people jumped up to hit the dance floor by the bar. Day 3 was our first example of an unexpected inconvenience with the itinerary--itinerary cities do not necessarily equate to port cities. The ship docked in Zons at 9:00 AM, where passengers interested in the Cologne tour were invited to board buses into the city center. The ship itself did not reach Cologne until 12:30 PM. We had planned to explore Cologne on our own, so this was a little irritating for us. However, we were invited to take the bus into the city with the rest of the passengers, and were reassured that we were welcome to explore on our own and part ways with the rest of the tour groups. That we did! Again, we were given detailed maps of the city, including the docking location of our ship. We explored the gorgeous Cologne cathedral on our own, had a pre-lunch treat at the Schokolademuseum cafe, and then enjoyed a wonderful lunch at the Fruh am Dom brauhaus, a recommended stop from a few friends, as well as Viking. In the afternoon, many passengers opted for the paid excursion to the Bruhl UNESCO Palaces. We opted to enjoy a more leisurely afternoon, but heard nothing but good things about both the morning tour and the afternoon palace excursion. The ship presented an 'Enrichment Lecture' at 5:00 PM entitled "Germany Today," which we also skipped. Per our request the night before, we left the ship again for dinner at a staff-recommended restaurant on the river, Fischmarkt. Dinner was fine, but not our favorite experience. It was difficult to tell if we simply ordered the wrong dishes, or if the restaurant was a poor recommendation. Either way, we still enjoyed a lovely evening outside under the heaters, and took a night walk across the love locks bridge to peruse a permanent fair on the far side of the river. We returned to the ship in time for the evening program, "Classical Music Journey" featuring a cellist and pianist from the Cologne Symphony Orchestra. This was a lovely program, tainted only by the rude behavior of a few select passengers who were apparently bored--and even offended--by classical music. Perhaps it had something to with the fact that bar service was suspended during the program out of respect for the musicians. During the program, we enjoyed a bottle of champagne and strawberries that were gifted to us in honor of our wedding anniversary. Our actual wedding anniversary was in September, but upon booking our cruise, the Viking representative told us that our 'new' anniversary would be in Cologne, and we would be celebrated accordingly. We did not object! We were warned in advance that Day 4 was a good day to stick with the group, so we ate breakfast and disembarked for the included excursion to Marksburg Castle. Viking transported us to Braubach by bus, where our ship later met us. The bus ride was comfortable and not too long. Marksburg Castle was probably our favorite excursion on the cruise. Our tour guide was excellent, and the castle itself was fascinating. Even the gift shop proved interesting, and there was a small cafe onsite for anyone who was ready for a mid-morning treat after the tour. This was probably the most demanding excursion, and the terrain within the castle was reasonably difficult to manage for anyone with mobility limitations. The guide, however, was quite helpful in identifying alternate routes for anyone who needed them. After the castle, we were bused down through Braubach to meet our ship. We opted to have lunch on the Aquavit Terrace for two reasons: 1) the weather was absolutely magnificent, and 2) the afternoon program was scenic sailing along the Middle Rhine with commentary from our Program Director. The terrace and sun deck provided the best viewing opportunities for this scenic sailing. The staff provided print maps of the Middle Rhine, identifying villages and castles that we would be passing. Program Director Daniel provided commentary over the PA system, available to anyone in the Lounge, Aquavit Terrace, or sun deck. There were absolutely many beautiful castles and villages, and it was a relaxing afternoon spent on the terrace. The commentary ended a bit early to allow time for the Rudesheim Coffee Demonstration and Teatime, where the staff showed us how to make traditional Rudesheim coffee and served it along with tea, sandwiches, and various treats. Afterward, Daniel presented a program in the Lounge about other Viking cruise opportunities, which we skipped. At 5:00 PM, we arrived in Rudesheim and left at 6:30 PM with a group for the "Dine in Rudesheim am Rhine" paid excursion. We boarded a multi-car tram dubbed a "mini train" and endured a chilly, bumpy ride into the heart of Rudesheim. The town itself was charming, but the excursion was a bust. Dinner was a set menu with mediocre food, offered in a boisterous, Americanized setting. The obviously talented band was wasted on cover songs clearly directed at the cruise crowd, and we were pulled from our seats regularly to participate in activities like Schnapps shots or a cowbell performance. I would not recommend the excursion for future sailers, but do think Rudesheim is worth exploring in the evening. We walked back to the ship, winding our way around the town, and were charmed by the sights. When we returned to the ship, Andrew went up to the desk to make a request that warmed my heart. While we were eating our mediocre dinner on our excursion, the menu in the restaurant on the ship included a white and milk chocolate mousse for dessert--one of my absolute favorites. Around 10:00 PM, Andrew inquired as to whether or not we might be able to have some leftover mousse from dinner. 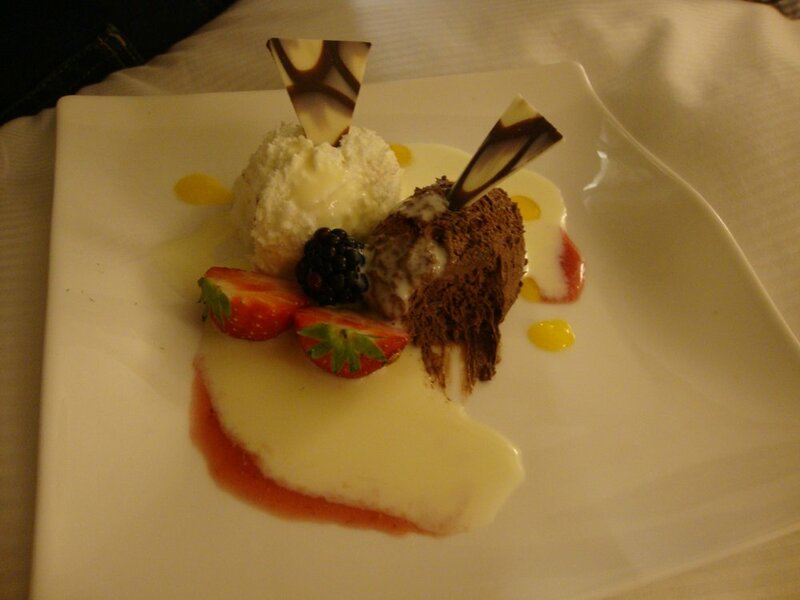 The staff member at the desk left immediately to the kitchen, and return with a fully-plated dessert for us to enjoy in our room. This was one of many examples to highlight the exceptional service on board, and the willingness of the staff to move mountains for any and all passenger requests. During the previous evening's port talk, Andrew and I absolutely groaned over the Heidelberg schedule. The bus would depart from Mannheim at 9:30 AM for a 30 minute bus-ride into Heidelberg. From there, the walking tour would move through various parts of town, including a bus ride midway to a different part of town. There would be some free time, but all in all the excursion would take nearly 6 hours, and most of that would be guided or on the bus. After breakfast, a leisurely morning on board, and lunch with probably a handful of other passengers who stayed behind, we docked in Speyer around 1:00 PM. The staff provided walking maps and recommended the Technik Museum, which we decided to explore. My oh my, what a find! Though this was definitely more Andrew's thing than my own, I was still impressed and overwhelmed by the sheer magnitude of the Technik Museum's collection. There were two giant hangers filled with cars, planes, firetrucks, and motorcycles. In addition, the surrounding grounds were packed with planes, ships, submarines, and helicopters that you could climb into. The piece de resistance, of course, was the giant Lufthansa 747 suspended high above the ground that we could climb in and on. Children and adults alike squealed as they flew down the enclosed spiral slide, an optional exit. After the museum, we walked to Speyer's cathedral and enjoyed a fantastic piece of cherry something in a local cafe. Dinner on board that evening included a mesclun salad with figs, shrimp egg rolls with ginger sauce, honey bbq salmon with leeks, and a porcini mushroom ravioli. Ah, Strasbourg. I smile just thinking of you! One of the reasons we booked this particular Viking itinerary was to explore the Alsace region of France. We wanted to determine whether or not we should return to this region for our next international trip, an in-depth exploration of France. We learned the we are quite fond of the region, and of Strasbourg in particular. This is a good city to explore on your own, if you find yourself tired of guided tours by this point in the itinerary. Once again, the ship (unexpectedly) did not dock in Strasbourg. Instead, we were across the river in the German town of Kehl. The included tour bus ride was going well out of the way into the city, taking a one hour scenic tour "on the way". As an alternative, the staff told us how to take Kehl's tram into Strasbourg, a 5-minute walk away and a 20-minute ride into the heart of Strasbourg. I believe the tram cost something like €1,70 per person. Upon arriving in Strasbourg, we quickly noticed that every two storefronts or so were home to a boulanger, or French bakery. We immediately found one that looked promising and walked out with some pain au chocolat and another pastry that we could not identify. Neither disappointed--the French know what they're doing with breads and pastries. On top of that, everywhere you turn in Strasbourg is postcard-worthy. We wandered Strasbourg, and eventually found our way to our pre-determined lunch choice for the day, Au Petit Tonnelier. Based on our research, we selected this particular restaurant because of their menu, reviews, and proximity to both the Cathedral and Palais Rohan. Our meal was lovely, and included a regional pinot blanc, goat cheese salad with bacon from some sort of small bird, vegetable gratin featuring an unknown autumn variety, and a filet of fish with cream sauce. The English translations were a bit vague, so we weren't entirely sure what we were eating, but everything was delicious! After lunch, we headed back to the Cathedral, the highest medieval building in Europe. Both the interior and exterior of the Cathedral were breathtaking--I could not help but feel that someone knew my exact preference for design and built it accordingly. Photos do not begin to do it any sort of justice. Worth noting: the Cathedral was closed for lunch, and reopened at 2:00 PM. When we left the Cathedral, we walked to a nearby tea room that we identified in our research of Strasbourg: Au Fond du Jardin. Intimate and floral, they did not have any available reservations for afternoon tea, or speak much English. But the tea house is known for its madelines, delicate, edible works of art. We purchased two to sample, as well as two homemade marshmallows. Many of the treats are infused with various types of flowers, which can be a bit disorienting for the unaccustomed palate--AKA most people. By mid-afternoon, we felt that we had enjoyed a nice overview of the city, and met a Viking guide at a pre-determined location to walk us back to the shuttles, offered periodically throughout the afternoon. We skipped two afternoon onboard programs: a cooking demonstration, and an enrichment lecture on Alsace during WWII. In the evening, we enjoyed the "Taste of Germany" dinner in the restaurant, which was essentially a giant buffet of German meats complemented by Kolsch beer. There were pretzels, meats, and cheeses on our tables when we arrived, and we were entertained by a violinist and accordionist who wandered the ship playing traditional German tunes. Many of the ship's staff were decked out in their Octoberfest costumes, and they gave a short little chat about lederhosen just before dinner. The evening program was an International Music Trivia contest in the Lounge, which we again opted not to attend. Day 7 has very little to do with Breisach, and much more to do with the included and optional excursions available: the Black Forest, Colmar Village, and the World War II Tour of Colmar featuring the Colmar Pocket Museum. Based on web reviews, we decided not to participate in the Black Forest tour. This included four hours mostly on a bus, touring the Black Forest and stopping at a cuckoo shop. I believe black forest cake was involved, at some point. Our acquaintances who went on the excursion had a good time, but I think they were all seriously interested in purchasing cuckoo clocks, which may have had something to do with it. Instead, we decided to explore more of Alsace and went on the paid excursion into the Village of Colmar. It took about 30 minutes to get there by bus, but our guide was with us on the way there and provided some commentary along the way. We semi-reluctantly went on the included walking tour, then wandered Colmar on our own for an hour or so before we had to leave. The village is lovely and full of history. Its major claim to fame is that it was home to Frederic Bartholdi, sculptor of the Statue of Liberty. There are tiny plates on the sidewalks throughout town to remind you that this is Bartholdi's home town, in case you forget. But the rest of the village is quite charming, and lovely to walk through. We enjoyed several shops, including a bakery stop for pastries and a biscuit shop that our guide pointed out on our tour. We returned to the ship for lunch and a leisurely afternoon on board, then reluctantly attended the Farewell Dinner, sad to see the trip coming to an end. The meal was a wonderful send off, and was stretched to four courses to mark the occasion. Courses 1, 3, and 4 still included options, while the 2nd course was set. We immensely enjoyed everything that was presented to us, including salmon tartar, roasted forest mushroom veloute (soup) with mushroom chips and truffle sabayon, pumpkin mousse ravioli with lamb loin, grilled marinated perch with couscous and balsamic brown butter, a crisp dark valrhona chocolate tart with mango salad, and apple strudel with vanilla sauce. Gigi played in the Lounge after dinner, but we opted to pack our bags and relax before departing the next morning. I'm sure Basel is lovely, but we did not see much of it due to our 10:40 AM flight. In the morning, we set our bags out according to the schedule Viking provided and enjoyed one last breakfast in the restaurant. The Aquavit continental breakfast was open extra early for the unlucky few departing between 4:00 and 6:00 AM; fortunately we were not among them! Just as we arrived, we were bused to the airport and accompanied by a Viking representative to the ticket counter. The airport in Basel is small, and was mostly deserted. It was a smooth trip home, though our connection in Frankfurt--including a pass through customs--was definitely tight. We were half-running to get to our gate in time, but did make it with a little room to spare. We booked our cruise because we have been extremely busy and stressed for the last year or two, and wanted someone else to do all of the worrying for us on vacation. The Viking staff, ever attentive and proactive, certainly did that marvelously. It was luxurious to be treated so well, and to be driven around without a care in the world. The staff provided helpful tips about interacting with the local culture, and any warnings that might be relevant, such as pickpocketing on tours near the major sites. The food was good, the accommodations were comfortable, and I would argue that the service was as good as it can possibly be. By mid-week, staff members were learning our names and greeting us as friends. They went well out of their way to make our trip as good as it could be--Andrew even overheard a staff member on the phone trying to arrange a horseback riding excursion on behalf of a passenger. Unlike an ocean cruise, the river cruise allows the boat to get much closer to the port cities. Though we did have to endure a bus ride or two, we were rarely on the bus for more than 15 minutes, and were still much closer to our destinations than an ocean cruise can offer. Because of the size of the boat and the number of passengers, the staff were extremely attentive, and the amenities were a bit more luxurious. From what we've heard, the food on board was significantly better than the food offered on ocean cruises, probably for the same reasons. The two biggest hangups for us were 1) the forced socialization at meals and 2) the lack of introvert space. In the restaurants, tables are laid for 6 or 8. If you want the good food, you have to sit with other people. For people traveling as a group of 4 or more, this was no problem at all. But for us, we often found ourselves sitting with new people, and going through the small talk routine over and over. Yes, most of the people we met were absolutely lovely! But it would have been nice to enjoy a good meal alone on occasion. By Day 5 or so, we finally caved and migrated toward the other young people. Yes--there were other young people on board! We were as surprised to see them as they were to see us, I think. There were two young couples on board for their honeymoon, another couple celebrating their first wedding anniversary, and a sibling pair traveling together. We found meals with this group to be much less exhausting, as they spent more time laughing and joking, and less time going through the small talk routine. The boat was on the smaller side, for sure, so there wasn't a lot of opportunity to be on our own. The river cruise really is more about what happens off the boat, as opposed to ocean cruises which offer more extravagant performances and productions. This is all a matter of preference, in my opinion, and not really a con so much as a heads up. Even though we didn't care much about onboard programming, we still felt that the programming was oriented strongly toward the older crowd. Many of the other young people on board were content to have drinks in the Lounge after dinner, but that just isn't our scene--we're not 'partyers' in the traditional sense. It didn't really prove to disrupt our experience much, but the onboard entertainment left much to be desired, especially as younger people. As I mentioned above, if you want to explore on your own there can be some hangups in doing so. We planned to do our own thing in Cologne, Heidelberg, Strasbourg, and Colmar, but were sometimes forced into group transportation at the least, and sometimes into a tour. The logistics were not given in advance, so it wasn't easy to plan our own activities. The staff was extremely helpful in making every effort for us to explore independently, but the trip certainly isn't designed for that kind of independent exploration. So who should go on a Viking river cruise? For their target demographic, Viking does an excellent job of exceeding expectations. Individuals, couples, and groups in their 50s, 60s, 70s, 80s, or 90s (yes, 90s!) will be delighted by the quality of service and the programming that is tailored for their preferences. Several times on board I thought to myself, "Man, my parents are going to have a blast!" For young people, there are a few reasons that one might choose to go on a cruise. For us, it did prove to be a relaxing, low-stress way to see places we probably wouldn't see on our own independent international vacations. The world is big, after all, and you can only see so many places. The cruise provides a nice way to 'knock out' multiple destinations in a short amount of time. For others that we encountered on board--both young and old--the cruise provided a way to "practice" traveling internationally for the novices, or a safe space for anyone anxious about interacting with non-English cultures. Many passengers seemed anxious about attempting to speak the local language, or offending the locals out of ignorance. Other passengers could have benefited from being more concerned about these cultural interactions. We were a little embarrassed on behalf of our country on multiple occasions, but that is to be expected, I suppose. For anyone into tours, architecture, history, and educational insights in combination with your international travels, you will probably have a marvelous time. The value for the cruise is maximized by anyone who dives in for every included excursion, eats most or all meals on board, and drinks all the free wine they can stand during meal times. In summary, we found our time on the Viking Hlin to be relaxing, rejuvenating, and fun. We were certainly reluctant to return home, and would have happily stayed put for another week or two. If you have any additional questions or are curious about aspects not mentioned in my review above, drop me a note in the comment section below!